The 5 Points intersection is at the center of the historic Biddleville neighborhood, and serves as a gateway between the Uptown area and west Charlotte. The intersection of West Trade Street, State Street, West Fifth Street, Rozelles Ferry Road and Beatties Ford Road — known as 5 Points — is already a bustling center of the Biddleville neighborhood in west Charlotte. Students from Johnson C. Smith University go in and out of the campus gate on their way to Mosaic Village or to grab a bite at Church's Chicken across the street. Construction workers hammer away at the sidewalk with jackhammers, a sign of the growth that Charlotte's oldest black neighborhood has seen in recent years. Now, organizers are hoping that on November 18 people will get a glimpse of how that growth will play out during 5 Points Better Block, a project that will make use of abandoned storefronts in the area, and open the streets around the historic intersection to artists, vendors and other uses. 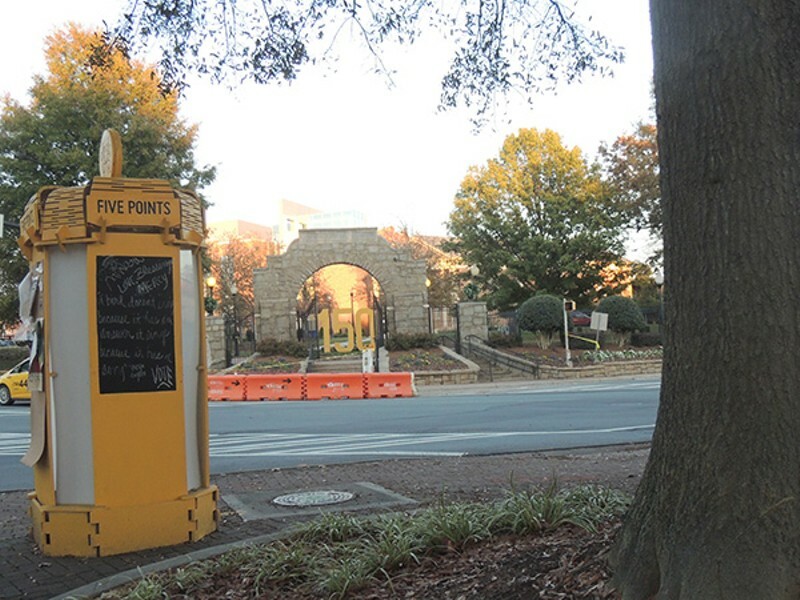 The 5 Points Better Block project will ultimately shape the final design of the city's Capital Improvement Project in 5 Points. Shannon Hughes, who has worked with city officials on the CIP, said he's optimistic about what Better Block can bring to 5 Points. "I think that it will be very impactful, if it's done properly," said Hughes, who is also president of the nearby Wesley Heights Neighborhood Association. "I feel that the community wants to see some nice amenities in 5 Points. That's a core intersection that most people who live in west Charlotte drive through to get home, and it's a historic area where the university meets with the communities." The 5 Points Better Block project is a reimagining of similar projects that have been held throughout the country in recent years. The first one to take place in Charlotte was in September in the Belmont community, another historically black neighborhood that's seen its share of growth and gentrification recently. According to Alysia Osborne, the project will be a piece of the larger Historic West End Initiative, which she directs. 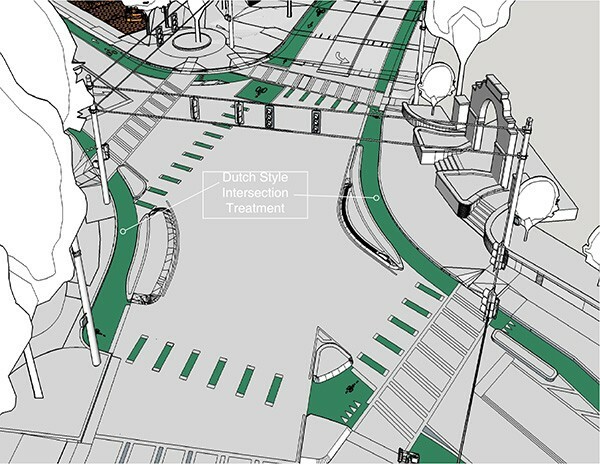 She said city officials already have some preliminary designs for ways to transform the intersection, making it safer and more walkable, and Better Block will be a way to test some of those uses. Features in the plans for 5 Points Better Block include protected bike lanes, better lighting and a bandshell in the plaza near the intersection. A rendering depicts changes planned for the 5 Points intersection for the Better Block event. "The city's been working for the past three years to engage the community around design," Osborne said. "So this is a way that we thought we could test the city's design." Organizers began holding community meetings in early September to get input from neighborhood residents about what they'd like to see accomplished at Better Block. This week, it all comes to fruition. On Tuesday, volunteers began work on prepping the space for Saturday's event. They will spend much of Thursday and Friday building things for weekend event, when they hope to see everyone in the community out enjoying themselves and giving feedback to designers about what works and what doesn't. Eric Orozco, an urban designer with Neighboring Concepts who's working on the CIP, said Better Block will be an opportunity for him to hear from residents about the best ways for him to approach his work later on. "I am there to observe," Orozco said. "As one of the designers, what I want to see is what works. Does the bandshell really work? We'll be out there with the landscape architect observing how people are using the space. We haven't started the design work, we have a concept plan, so we're waiting to see how people are using the space before we make the design proposals. The hope is that we discover new ideas that we can actually implement." It won't just be about roads and design, however. A bevy of local vendors and artists are showcasing their work and creating collaborations for Saturday's event. 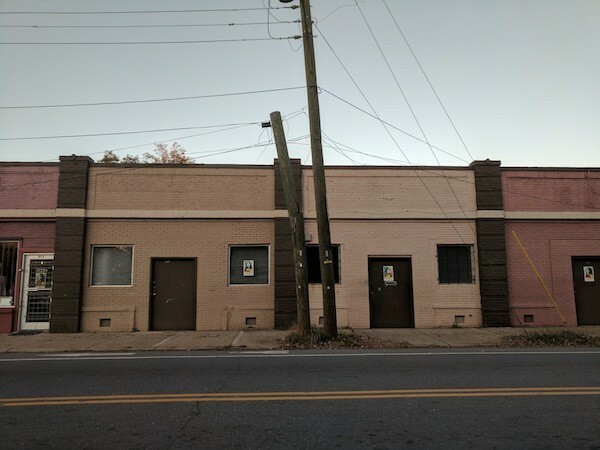 Local artist Janelle Dunlap is partnering with the west side's own Enderly Coffee to open an art gallery and coffee shop in one abandoned storefront. Members of the West Side Community Land Trust will be camped out on the grass outside of Clinton Chapel AME Zion church hosting a space with a sound garden for kids and a fire pit. They will also carry out a project throughout the day in which they attempt to build a small-scale replica village. "Our plan is to utilize found objects in creating a little, tactile play village for adults to play around with, 'How would you put together a livable, flourishing village community?'" said Helms Jarrell, a board member with Westside CLT. Jarrell heard about Better Block through Orozco, who is also on the Westside CLT board, and decided to get involved. She said she wishes there was more community input about what events are going to take place on Saturday, but she's excited to pitch in to help it be as successful of a day as possible. "We had this idea, we were taking it off of the original guy in Texas who did Better Block, he took the resources of the neighborhood and did what the neighborhood wanted — which doesn't necessarily feel like what they're doing here — but we just kind of wanted to embody that," Jarrell said. "To me that was very community-based, but they're doing it a little bit differently here because its coming from a corporation [Center City Partners] and a design firm." Other residents voiced concerns about whether the event would launch successfully on Saturday, with the staggering amount of work that remains to be done. J'Tanya Adams, a neighborhood leader who recently ran to represent west Charlotte on Charlotte City Council, said she was contacted just recently and asked if she could help recruit volunteers. Osborne said she's optimistic the construction schedule will remain on pace and Saturday's event will be a success in laying out a map for how to move forward with 5 Points. "The city's never done this before in terms of actual construction," Osborne pointed out. "It could be that in the future the city actually tests some of these ideas using tactical urbanism; something quick and using temporary materials to activate underutilized or vacant space. It's really about using what you have and not spending a great amount of money, and it's quick in a specific location. It's a powerful way to test an idea." And as Orozco pointed out, one can never underestimate the folks in west Charlotte when they they're faced with a goal. "My experiences with this corridor is that the community will always surprise you," Orozco said, laughing. "They always seem to come in at the last second and do more than is expected of them."